These will become a fall-back weeknight dinner for you! 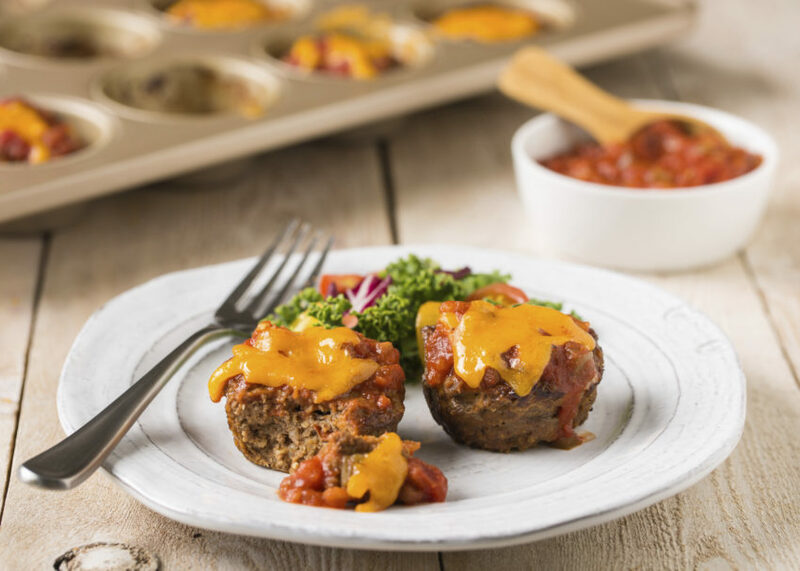 There are only 5 ingredients in the mini-meatloaves themselves, and that is all because of using salsa instead of chopping onion, garlic, bell pepper, etc. Not that we all don’t love to chop onion, but sometimes, you just don’t have the time. So it’s suuuuper unfortunate that there is one condiment that we can use instead?. I call salsa my “swiss army knife” of quick, healthy recipes, because it can do so many things! They also contain chili powder, but you can scale that to the kind of kick you want in your meatloaves. If you don’t like so much spice, make sure to use a mild salsa instead of medium or hot. I find that a mild salsa plus 1 teaspoon of chili powder is perfect for us. Also, this time of year I cannot get enough of protein-filled recipes that I can FREEZE! Are you the same? If you want to freeze these for later use, just let them cool to close to room temperature, and then put them in freezer zip-top bags in a single layer, and label the bag with a sharpie (possibly my favorite kitchen tool ever 😉 Use within 3 months. I hope you like them! You can watch a video of them being made below! Post your thoughts below and have an amazing fall day! 2. In a medium bowl, add egg, salsa, chili powder and salt, whisking with a fork to combine. Stir in oats. Fold in ground beef gently until all ingredients are evenly incorporated into the beef. 3. Coat a muffin tin with nonstick spray. Divide ground beef mixture among 9 of the muffin tins, pressing the beef down slightly in the center. 4. Bake for 15 minutes, then remove and add a teaspoon of salsa to the center of each meatloaf, and top each with at tablespoon of cheddar cheese. Put meatloaves back into the oven for another 5 minutes, or until fully cooked. 5. Remove from oven and let cool 2-3 minutes, then remove mini meatloaves from muffin tin and serve!